Project obstacles and solutions: The City of Lafayette, IN was faced with a major obstacle with their sewer system along Earl Avenue and the Durkees Run waterway. Their aging underground sewer had been built in 1916 with a combined storm and sanitary system which emptied into a wastewater treatment plant via Durkees Run. As time went by, the area grew with more housing, schools, businesses which all created more usage of the sewer system. In a heavy rain event, the streets would flood, particularly along Earl Avenue. Water would back up into basements. On the other end of the sewer run, the wastewater treatment facility could not keep up with the combined sewer overflow and would dump raw sewage into Durkees Run and the Wabash River. The Environmental Protection Agency (EPA) and the Indiana Department of Environmental Management (IDEM) cited the city for the overflow problem. A plan was drawn up to separate the sanitary sewer lines from the storm sewers, repair or replace aging pipes, provide overflow retention areas for storm water, and repave Earl Avenue to widen it and provide a walking trail. Bowen Engineering was awarded the contract on the project. Phase 1 of the project was started in 2012 with the re-routing and separation of sewer lines. Dealing with detoured traffic and limited access to residential and business properties were a major challenge. Over the two years since the project began, Bowen has either rehabilitated or laid new lines for over 1,000 acres of property. The construction process is lengthy on a project of this scope and public access to the area had to be a consideration. IMI has been instrumental in keeping the project moving forward. Whenever you are digging up old lines, there are bound to be surprises. Initially that surprise came in the failure of an existing sewer line that not only crossed under a major street, but a rail line as well. Bowen had to move quickly to rebuild this sewer line. IMI was able to provide imix Flexifill, a self-consolidating, flowable utility trench fill product that sets up in minutes. As other streets were excavated, unearthing abandoned utility pipes and water main breaks became a challenge. IMI supplied Class A concrete for the collars on the sewer mains. During the cold weather months, IMI supplied imix FreezeGuard to reduce set times and keep the project on schedule. Phase 2 of the project included the routing of new storm water sewer lines to two detention ponds that feed into Durkees Run. These ponds are meant to divert 100 million gallons of water away from the treatment plant annually and handle any overflow in a large rain event. Bowen constructed the holding areas. IMI supplied concrete for the overflow connectors and detention area base and walls. In the final phase, IMI has supplied concrete for paving along the length of Earl Avenue as the sewer lines were completed. That includes the street, sidewalks, curbs and gutters performed by Milestone Contractors. The streets were placed and finished with slip form pavers. In each phase of the project, IMI has supplied all of the concrete for this project. The main part of Earl Avenue reopened in the fall of 2014. 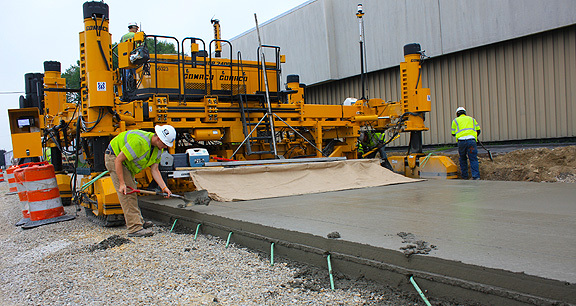 For more information on placing concrete in cold weather, click here. For more information on paving solutions, click here. For more information on fill products, click here.